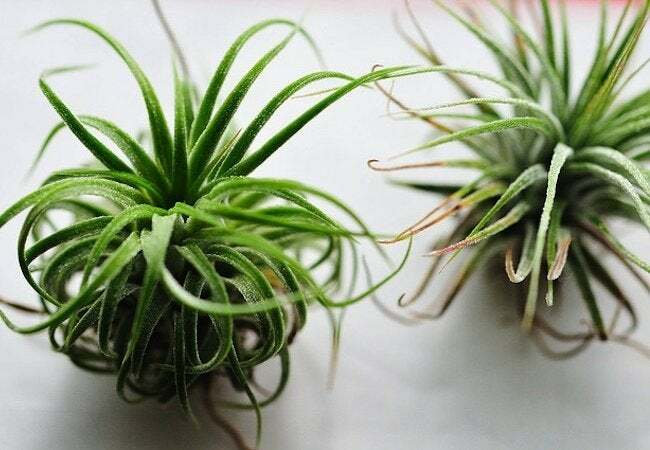 Air plants—or tillandsias—are one of my favorite indoor plants. I bought my first little pup about a year ago and since then, I’ve divided it into three larger versions of the tiny original. Some growers choose to let the plant grow undivided for years, but I like the idea of having a large group of easygoing friends. While the vibrant green spikes look a little complicated, they require minimal care. Because they don’t grow in soil, you can stick them in hanging glass globes, mount them on any sort of untreated lumber, or stick them into any other decorative item—a souvenir set of wooden shoes from Holland, for example. Not only does the foliage excite, but every once in a while, tillandsias put forth a lovely tubular flower that makes the plants all the more appealing. Could there be a more versatile, maintenance-free houseplant? Tillandsias require direct sunlight through the winter and a slightly filtered light during the summer months to avoid getting burned. Mine seem to be thriving in a west-facing window that gets about four hours of strong sunlight a day. While the instructions they came with suggested a good soaking in filtered water weekly, I usually only do this twice a month and then mist thoroughly with water every other day. I always use filtered water, as the plants are sensitive to chlorine. Tillandsia International, a great source for the plants, suggests also using a bromeliad fertilizer twice monthly, which I should probably start doing to initiate another blooming cycle. I divide when the new growth is about half the size of the original. After soaking you can feel when the plant is ready to divide, and the new growth can be wiggled loose.